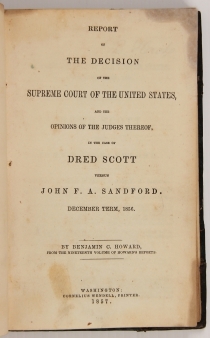 In Dred Scott v. Sandford (1857), the Supreme Court declared that blacks could not be United States citizens and that the 1820 Missouri Compromise was unconstitutional. The decision inflamed sectional tensions and helped trigger the Civil War. The decision was published simultaneously in New York and Washington, D.C. Both are considered the First Edition. In his “House Divided” Speech, Lincoln replied that the decision did “obvious violence to the plain unmistakable language” of the Declaration of Independence and our other founding documents. BENJAMIN C. HOWARD. Book. 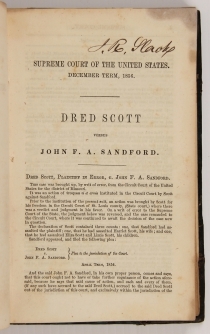 Report of the Decision of the Supreme Court of the United States and the Opinions of the Judges thereof, in the Case of Dred Scott versus John F.A. 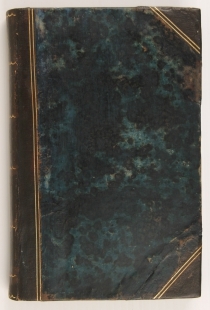 Sandford, December Term, 1856., Washington, D.C.: Cornelius Wendell, 1857. 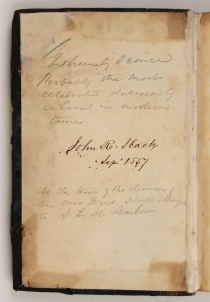 With two ownership signatures of “John R. Slack / Sept. 1857.” Slack was a N.J. attorney who had previously helped win a fugitive slave case. First edition. Fine condition. 239 pp. 5½ x 8¾ in. John R. Slack, A New Jersey Lawyer, served as counsel for Rev. Alexander Hemsley, who was born a slave in Maryland with the given name Nathan Read. Hemsley escaped slavery, but was caught and tried as an escapee under fugitive slave laws. Hemsley was eventually proclaimed a free man and emigrated to Canada (Hemsley’s narrative is included in Benjamin Drew’s Refugee’s from Slavery). Benjamin Chew Howard (November 5, 1791–March 6, 1872) was an American congressman and the fifth reporter of decisions of the United States Supreme Court, serving from 1843 to 1861. His study of law was interrupted by his service in the War of 1812 in which he reached the rank of brigadier general. A Democrat, he served on the city council of Baltimore in 1820 and both houses of the Maryland legislature. He was elected to the Twenty-first and Twenty-second United States Congress, serving from March 4, 1829 to March 3, 1833. In 1835, President Andrew Jackson named Richard Rush and Howard to arbitrate the Ohio-Michigan boundary dispute. He returned to Congress in the Twenty-fourth Congress and was re-elected to the Twenty-fifth, serving from March 4, 1835, to March 3, 1839. During this service, he chaired the House Foreign Relations Committee for four years. In 1861, he was one of the emissaries sent by President James Buchanan to try to secure a peace with the Confederacy. That year he unsuccessfully ran for Governor of Maryland. He died in Baltimore and is buried in Greenmount Cemetery. The Dred Scott decision demonstrated the extreme pro-slavery position of the Court and helped to precipitate the Civil War by emboldening Republicans and dividing the Democratic Party. In 1846, Dred Scott, a slave who had lived in the free state of Missouri, filed suit for his freedom in the St. Louis Circuit Court, beginning an eleven-year legal fight. Chief Justice Roger Taney, in his opinion for the court, declared that all blacks, slaves as well as free, were not and could never become citizens of the United States. The court also declared the 1820 Missouri Compromise unconstitutional, thus opening up all federal territories to slavery and ruling that slaves did not become free when taken into free territory. Dred Scott had accompanied his master, John Emerson, an army physician from Missouri, into the state of Illinois and the territory of Wisconsin, neither of which allowed slavery. Wisconsin was part of the Louisiana Purchase and had been declared free under the Missouri Compromise legislation of 1820. While in Wisconsin Territory, Emerson married Irene Sanford. When Emerson died in 1843, John Sanford, Irene’s brother, became executor of the Emerson estate, and they brought Scott back to Missouri. In 1846, Scott sued Irene Emerson and John Sanford, claiming that several years of residence in free territory made him free. He won in a local court, but the Missouri Supreme Court overturned the decision. 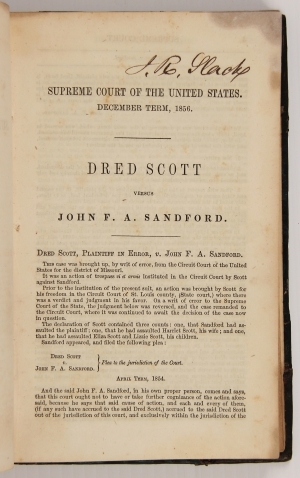 Scott and his abolitionist supporters initiated a new case in the federal court system – they lost in circuit court and then appealed to the U.S. Supreme Court in 1854. Marylander Roger Taney and his fellow justices could have issued a narrow ruling upholding the decision of the state supreme court. Instead, perhaps looking to use the power of the judicial branch to end the crisis of “Bleeding Kansas,” Taney struck down the Missouri Compromise, upheld the right of slaveholders to carry their property in any federal territory, and denied the claim that an individual of African descent could ever become a U.S. citizen. The decision was announced to the country as James Buchanan was assuming the presidency in March 1857. Buchanan attempted to use the prestige of the court to support the legitimacy of the pro-slavery Lecompton Constitution in Kansas. This provoked a firestorm in the North, particularly in Illinois, where Republican Abraham Lincoln challenged incumbent Democratic Senator Stephen Douglas in the 1858 senatorial election. Lincoln put forth powerful, abstract ideas during the famous debates with Douglas, but he was, for the most part, arguing specifically against Dred Scott and Lecompton. Lincoln claimed that the Dred Scott case was evidence that Taney and Buchanan, with southern Democrats, constituted a “Slave Power,” and that the logical next step for the Slave Power would be to declare northern state abolition acts unconstitutional. Lincoln forced Douglas to come to a new position on slavery in the territories, which argued contrary to the Supreme Court, that the people of a federal territory could decide not to offer positive protection to slaveholders. This so-called “Freeport Doctrine” led inexorably to the schism of the Democrat Party, a major factor in Lincoln’s 1860 presidential victory and the momentum toward Southern secession. Dred Scott, in the meantime, was returned to his original owners. The Blow family manumitted Scott and his wife later in 1857. Scott died the following year. Spine eroded, edges and corners bumped.